Volleyball Festival – Join the IPV family! Location: Phoenix Convention Center, AZ- 100 N 3rd St, Phoenix, AZ 85004. See “B” on map below. Player Fee: $750 per player. Payable in 3 payments of $250 due on 3/15, 4/15, 5/15. Covers team flight to AZ, dorm, cafeteria, tourney entry, AAU memberships, 6/26 meal & Light Rail from airport, tourney give aways. Playing Waves: 14HP/17HP/18HP- am wave; 16HP- pm wave. Travel to Phoenix: Players/Coaches travel on Team Flight on 6/26 on SW#22377. Flight departs Midway 11:35am, arrive PHX 1:10pm. All Players should travel on Team Flight. Do not book flight on your own for 6/26 unless you have approved it with Patti. *Rapid Rewards #’s may be added to players SW account after the flight is complete. Call 214-932-0333, give them confirmation #KC833N. Once they confirm that you were on the flight they will credit your account. *Team flight cost to Phoenix will be included in Player Fee; family members on flight will pay separately. Flight cost for family members is $165 per seat. *Return flight for player is parent responsibility unless you book a seat on the return Group Flight with the coaches SW#5525 leaves PHX 6:15pm, arrive MDW 11:35pm. *Players traveling alone should book on Group Flight or plan to travel with another family. Cost: $165 per seat. *When booking your return flight make sure it is for 6:15pm or later to avoid conflicts with conpetition. 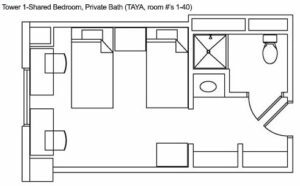 Player Accommodations: ASU Taylor Place Dorm, downtown Phoenix; 4 blocks from Convention Center. Parent Hotel Accommodations: book on own or reserve through the tournament Group Blocks below. Make sure you read through the policies & deadlines. Rooms reserved through the tournament receive complimentary admission to the Volleyball Festival. -These Group blocks require a 3 night stay. –Note: Hotel blocks are for 6/26-6/30; if your arrival or departure dates are different, make sure that you confirm this when reserving a room. Raffle Fundraiser: The Festival makes free raffle tickets available to all teams to assist in their fundraising efforts. Players sell the tickets for $5 each and keep 100% of their sales. Turn in completed ticket stubs to Patti. Cash prizes are provided by the Festival (Ten $100, Four $250 and Two $500 prizes) and are drawn at the Festival. Winners do not have to be present to win. 2019 WELCOME PARTY: Join us Wednesday, June 26 from 6-8 pm for the “Swing into the Jungle” Welcome Party! The beauty and excitement of the jungle will be on full display at our themed dance party at the Phoenix Convention Center. Come dressed in your best jungle themed costumes to have a swinging good time and kick off Volleyball Festival 2019! The tourney will have a Go Purple Day. Everyone is encouraged to wear purple to support the cause. 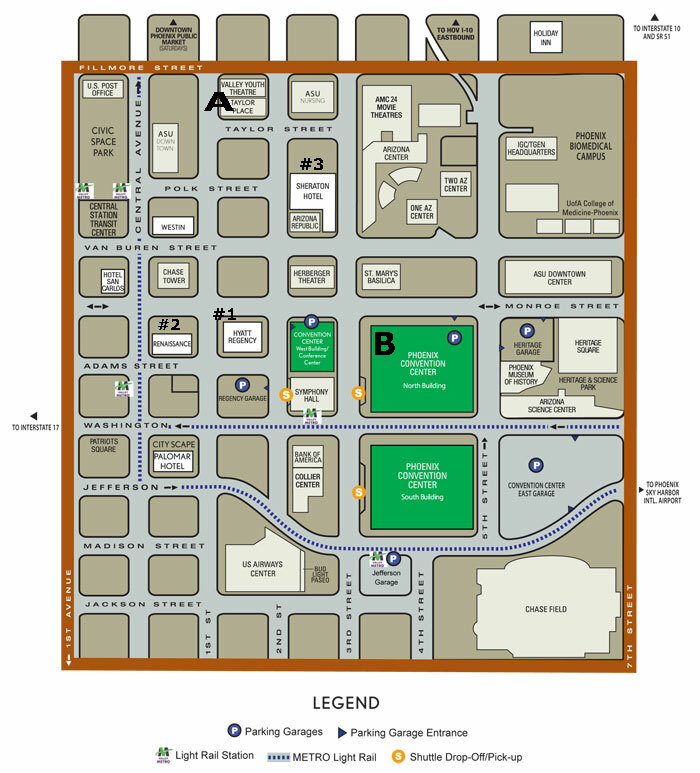 Metro Light Rail: Teams will travel via Light Rail from airport to Van Buren/Central Ave Station- short walk to dorm. Cost is $2 for adults, $1 for players. Teams may use Light Rail to Target Shopping area. Coaches/players traveling alone will use Light Rail for return trip to airport. Airport provides Sky Train from Terminal 3 & 4 to Light Rail station at 44th St & Washington. Trip is 5 min or less. Families arriving at Terminal 2 (United) will need to walk to terminal 3 for Sky Train access. *People traveling on SW or US Airways may use free Early Bag Check provided at 44th St & Washington Light Rail in the Sky Train area for return trip if it’s open. Phoenix Sky Harbor International Airport: Has 3 terminals. See map for airlines and Light Rail access.